HILO » U.S. Secretary of Agriculture Edward Schafer yesterday declared the Big Island to be a natural disaster area because of agricultural losses due to vog. The declaration will allow farmers to receive loans up to $500,000 at 3.75 percent interest, said U.S. Farm Service Agency official Lester Ueda in Hilo. Some observers took the announcement as another in a list of nice gestures with limited ability to provide relief from the volcanic gases. "I'm in my 60s. I don't want a loan," said protea grower Dan Wegner, who has 11 acres of the exotic flowers in Ocean View near the south end of the Big Island. Wegner has lost 80 percent of his product, and it would take him five years to recover, even if the vog stopped, he said. There's no sign it will stop. 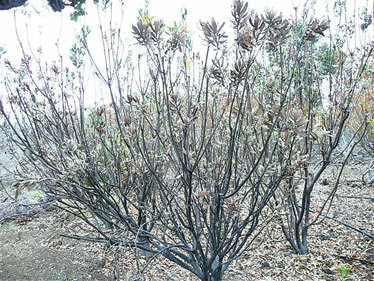 Dead protea plants stood 6 feet high on Dan Wegner's farm on Saturday after being hit by vog. U.S. Farm Service Agency official Lester Ueda said the damage can come as fast as if someone had laid a hand on the plants. Ueda said some other farmers feel the same way about going into debt. Two weeks ago, U.S. Rep. Mazie Hirono announced that the 2008 Farm Bill allows uninsured farmers who have lost money because of a natural disaster to buy insurance after the fact if they apply by Sept. 16. But Ueda says he doesn't have the rules yet for such losses. "It puts me in a bind," he said. Wegner said typical formulas in the past had farmers being reimbursed for just 30 percent of their losses. Still, he'd be happy to get even that much. "Anything is better than nothing here," he said. Scientists and Civil Defense officials are just as baffled about how to respond to the volcano's increased vog output. Hawaiian Volcano Observatory head Jim Kauahikaua said he has no way to track the gases once they leave the area of the vents. Civil Defense head Quince Mento said fire stations around the island give him reports twice a day, with descriptions like "clear," "moderate" or "extreme." But conditions can change from hour to hour. People can see it coming like a white cloud, he said. Mento gave up calling for evacuations after he made announcements and the air was beautiful all day, he said. He heard about someone mowing the lawn while the air held 8 to 9 parts per million of sulfur dioxide. Hawaii Volcanoes National Park considers anything above 1 part per million "unhealthy." Sensitive people should stay in the house or get in their car and get out of the area, he said. Federal health officials are coming Monday to provide assistance, Mento said. But their experience is with sulfur dioxide in workplaces, not from natural sources. "There's nothing really written about this countrywide," he said.